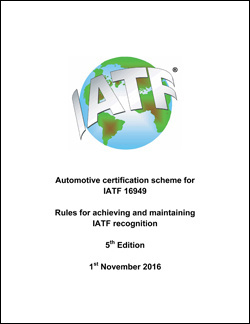 This document contains the Rules for achieving and maintaining IATF recognition related to IATF 16949. Now in its 5th Edition, the document is commonly referred to as "Rule 5th". It includes the criteria for certification body recognition, certification body audit process, certification body auditor qualifications, and IATF 16949 certificates. This document replaces "Rules 4th Edition" and encompasses previous Sanctioned Interpretations and Rules related Frequently Asked Questions (FAQ's) issued by the IATF prior to the release of this document.